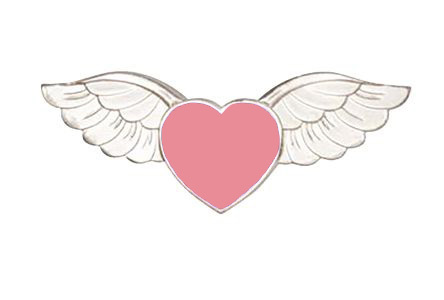 Guardian Angel wings with pink heart lapel pin. 1 3/4 inches wide. Silver tone finish. Carded "On the Wings of Love". Angel's wings symbolizes protection plus the heart symbolizes love. Pin backed. Can be used for breast cancer pin. Also available in purple Heart sku #3709Purple. Breast Cancer awareness traditional color. I am using these pins to sell as a fundraiser to support the family of a good friend and coworkers who passed away recently of breast cancer. We are nurses and the pins are perfect for a medical badge. They are very reasonably priced and really great quality! People liked them so much I had to place a second order. Shipping was extremely fast and a UPS tracking number was given right after order! Thank you! My wife was just diagnosed with breast cancer and wanted a special way to thank the Drs and Nurses working with her. She found your site and found the pink heart Angel wings and thought they would be perfect. And they were. We ordered and received them very quick. Big thank you.